Microsoft pushed a rudimentary system update for its Xbox One console exactly one month ago, and at the time, we were informed that a further, more significant update would be following in March. As per a blog post from Larry Hryb, AKA Xbox LIVE’s Major Nelson, the new bundle of features will begin rolling out as of today, and will include improved party and chat support, as well as preparing systems for next week’s big release of Titanfall. According to Hryb’s blog post, Microsoft has been listening to the voices and opinions of Xbox One users, and this update addresses "some of the biggest feedback" that the Redmond has gathered from early adopters so far. 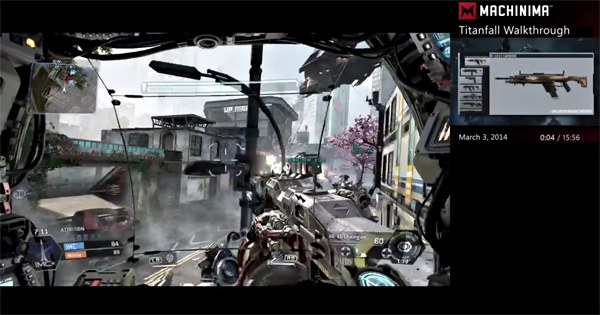 One of the key enhancements with this update is support for Titanfall, which Xbox One users will be able to enjoy on "the best multiplayer service on the planet," according to Hryb, when it releases next week. The game has drawn an incredible amount of hype and anticipation, and given that it is releasing exclusively to Xbox as far as consoles are concerned, Microsoft cannot afford any mishaps, particularly having lost a little ground on the PlayStation 4 so early on. With this update applied, hopefully, the infrastructure will hold up, and gamers will be able to enjoy the multiplayer features without so much as a hiccup. Sticking with the theme of multiplayer gaming momentarily, the update also brings better party / chat support, as well as improved friends list and profile features. 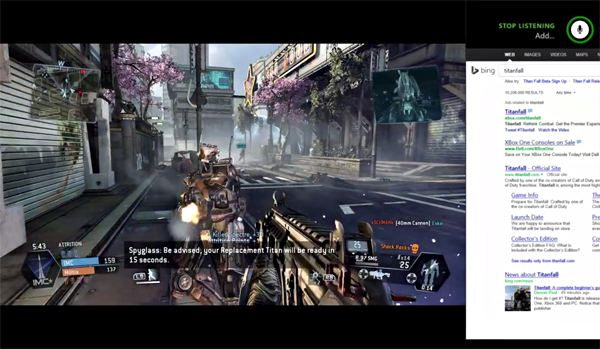 You can readily find and connect with folks you recently played games with or against, and within the activity feed, you can now see when friends are broadcasting their gameplay via Twitch TV. 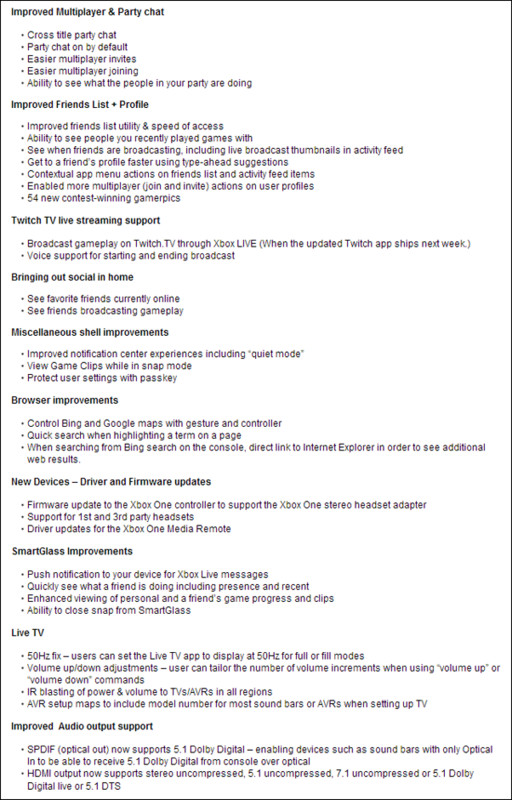 The updated Twitch app, which will allow console users to broadcast their gameplay (albeit, in 720p), will roll out next week, but this Xbox One system update ensures that the foundations are ready, and that very shortly, you’ll be able to show off that impressive 25+ kill streak with your buddies. 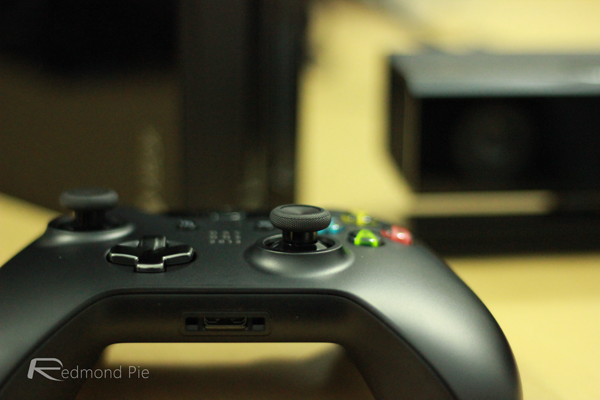 There are also several improvements to the notification center, gestures in Bing and Google Maps, and a firmware update for the Xbox One’s controller to support the Xbox One stereo headset adapter, which was released in the middle of last month.